On 28 July 2015, Parliament published the Copyright Amendment Bill for public comment. The Bill, which will amend the Copyright Act 98 of 1978, can be found online here. Submissions on the Bill can be emailed to Meshendri Padayachy at MPadayachy@thdti.gov.za until Thursday, 27 August 2015. Following detailed review of the Bill, the Fix the Patent Laws Coalition will publish comment on the Bill and make a submission to the Trade and Industry Portfolio Committee. On 28 July 2015, Parliament published the revised Protection and Promotion of Investment Bill. The revised Bill can be found online here. The updated Bill revises the Protection and Promotion of Investment Bill, which was initially published in 2013. 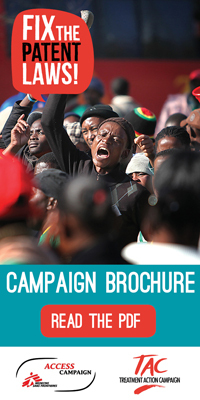 SECTION27 and the Treatment Action Campaign jointly made a submission on the 2013 Bill and the IP provisions contained in the Bill which can be read here. Médecins Sans Frontières also made a submission on the Bill available here. The provisions dealing with IP and compulsory licensing – commented on in the SECTION27/TAC and the Médecins Sans Frontières submissions – have been removed from the revised Bill. 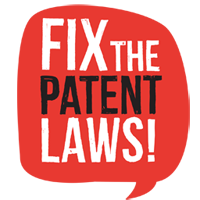 Fix the Patent Laws is a campaign co-founded by SECTION27, Treatment Action Campaign (TAC) and Doctors Without Borders (MSF) in 2011. Since then, the coalition has grown to include 38 other organisations fighting together to push South Africa to amend its patent laws to prioritise public health. Through this blog we will highlight how amending South Africa’s Patents Act 57 of 1978 will reduce the cost of medicines, improving the health and saving the lives of millions of South Africans. The members of the Fix the Patent Laws Campaign are as follows: Treatment Action Campaign (TAC), Doctors Without Borders (MSF), SECTION27, the South African Non-Communicable Diseases Alliance (SANCD Alliance), DiabetesSA, EpilepsySA, Marie Stopes South Africa, Stop Stock Outs Project (SSP), South African Depression and Anxiety Group (SADAG), Cape Mental Health (CMH), the South African Federation of Mental Health (SAFMH), Schizophrenia and Bipolar Disorders Alliance (SABDA), as well as the following members of the Cancer Alliance and Advocates for Breast Cancer: Breast Course 4 Nurses, Breast Health Foundation, Cancer Association of South Africa (CANSA), Cancer Heroes, Can-Sir, CanSurvive, Care for Cancer Foundation, Childhood Cancer Foundation of South Africa (CHOC), Hospice Palliative Care Association (HPCA), Igazi Foundation, Look Good Feel Better, Love your Nuts, Lymphoedema Association of South Africa (LAOSA), Men’s Foundation, National Council Against Smoking, National Oncology Nursing Association of SA, Pancreatic Cancer Network of SA (PanCan), People Living With Cancer (PLWC), Pink Trees for Pauline, Pink Phoenix Cancer Foundation, Pocket Cancer Support, Project Flamingo, Rainbows and Smiles, Reach for Recovery, South African Oncology Social Work Forum (SAOSWF), The Pink Parasol Project, The Sunflower Fund, Vrede Foundation and Wings of Hope.